This immaculately maintained spacious home is one of few single-family Colonial in INDIAN FIELD. With 5 BR, 4 FB and is set on nearly a half-acre, level corner lot. Flawless landscaping & in-ground spklrs, top-quality maintenance-free HardiePlank siding, updated windows & roofing, private yard & spacious deck. Main level has a sky-lit, grand foyer, leading to the formal LR & DR. The large kitchen features an informal dining area, island, leads into the family room w/ wood burning FP & wet bar. The 1st floor is finished off with a BR, FB, laundry/mud room & large 2-car garage. The 2nd floor features MBA, walk-in closets, lrg bath w/ jetted tub, shower and dual vanity. 3 add'l BR's & FB complete the 2nd floor. Lower level is a full, finished family/rec room oasis, w/ pool table, wet bar, FB, workout room & storage. The amenities include a pool, 3 tennis courts, Bball court, walking paths, scenic pond, clbhs, and low maint. fee of $159 per month. Don't miss this rare opportunity. 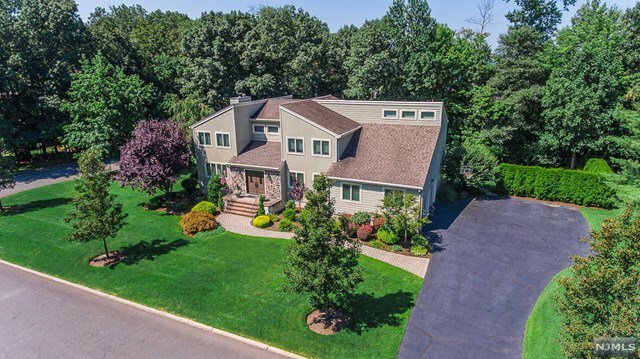 Listing courtesy of Weichert Realtors Ridgewood. Selling Office: Keller Williams Village Square Realty.